During the first week of September, Hurricane Florence, a Category 4 hurricane still located hundreds of miles offshore, was setting its sights to make landfall along the North Carolina-South Carolina coast. While some residents waited to see where its path would lead, others decided to heed warnings issued by the governor of North Carolina to evacuate their low-lying coastal homes. 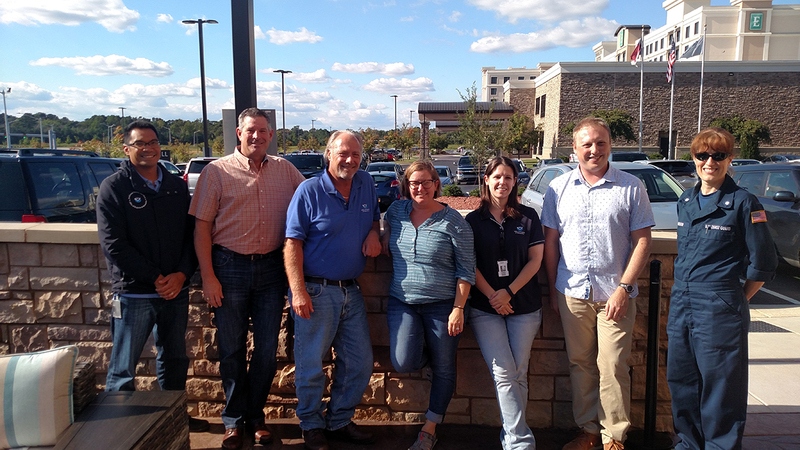 From left: Mike Greer (OR&R), Mark White (Research Planning Inc.), Frank Csulak (OR&R), Christine Boring (Research Planning Inc.), Katie Krushinski (OR&R), Brian Thom (Research Planning Inc.), and U.S. Coast Guard Gulf Strike Team Commanding Officer JoAnne Handson. Not pictured are George Graettinger, Adam Davis, Robb Wright, and Nicolle Rutherford, who were also deployed for OR&R’s response efforts following Hurricane Florence. As impact became imminent, NOAA’s Office of Response and Restoration (OR&R) began tracking the storm’s path and intensity. OR&R facilitated daily coordination calls with several other NOAA entities along the coast (including National Marine Fisheries Service and National Marine Sanctuaries) to prepare for potential impacts to NOAA staff, assets, and facilities. As OR&R continued to monitor the storm’s path and it became apparent Florence would make landfall in Wilmington, North Carolina, the team prepared to deploy staff to the area. Among the first to arrive on scene were scientific support coordinator Frank Csulak and spatial data experts George Graettinger and Mike Greer, who support the management of OR&R’s Environmental Response Management Application (ERMA) — a mapping tool frequently used as a common operating picture by NOAA, the U.S. Coast Guard, and other response agencies. Their goal was to ingest post-event data from the National Geodetic Survey, Office for Coast Survey, Environmental Protection Agency, and other sources to determine the worst hit areas for flooding, coastal erosion, displaced vessels, and waterway obstructions. This effort allowed the U.S. Coast Guard to focus primarily on conducting search and rescue operations and clearing waterways to reconstitute vessel traffic, especially in the ports of Wilmington and Morehead City. “The OR&R team knocked it out of the park in terms of supporting the Coast Guard,” Csulak said, adding that the NOAA team had the lead for using the National Geodetic Service’s aerial imagery to locate and identify displaced vessels. The Coast Guard then used ERMA as their common operating picture to visualize the location of these vessels, the habitats they ended up in, and prioritize vessels for removal. On Sept. 19, 2018, the Federal Emergency Management Agency’s mission assignment tasking took effect and a pollution task force was established. Emergency Support Function #10 (ESF-10) is the framework coordinating federal and state agency response to actual or potential oil spills or hazardous material releases in the FEMA designated counties. Partnering ESF-10 agencies include NOAA and the Environmental Protection Agency. The ERMA team was now focused on analyzing aerial imagery to locate displaced vessels and potential hazardous substance releases. This coupled with field assessments helped the Coast Guard determine which vessels had the highest chance of leaking or those that were located in the most environmentally sensitive areas. Other team members coordinated with various state, federal, and nongovernmental agencies to develop best management practices to minimize any collateral impacts from the displaced vessels and coordinate Threatened and Endangered Species Act and Historic Preservation Act concerns with ongoing and planned response activities. The Coast Guard and NOAA work to remove the pollutants from displaced vessels, however, the state of North Carolina is responsible for either arranging for the return of the vessels to their owners, relocating them out of sensitive areas, or disposing of them. NOAA advised the state of the environmental risks to habitats such as waterways, wetlands, oyster beds, seagrass beds, turtle and bird nesting areas. OR&R’s Katie Krushinski stepped on scene as a member of the North Carolina Joint Information Center — serving as the link between NOAA and the incident command post. She vetted NOAA-related inquiries from the public and media and was the conduit to share NOAA-specific information to support U.S. Coast Guard press releases. Krushinski’s role evolved and she served as the public information officer for the ESF-10 response. As of Monday, Oct. 1, 2018, a new team of experts relieved the on-scene staff. OR&R personnel overcame the challenges of working in the aftermath left by Hurricane Florence — dealing with road closures and other navigation issues as well staffing and resource shortages. Teams will continue to notify and educate vessel owners on the best ways to remove their property. The Coast Guard will assess the targets one more time before beginning hazardous material removal. This is an ongoing response that takes planning to ensure the safety of the environment as well as the community. As the establishment phase of the response efforts wraps up, implementation of response strategies and actions will soon begin. Much of the success in responding to Florence can be attributed to the prolonged response during the 2017 hurricane season.